On a Cruise? Don’t Miss the Boat! Are you coming to Grand Turk on a cruise ship? It’s best to book your Parasail excursions early, way BEFORE your cruise. Why? 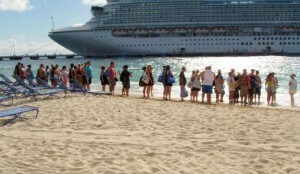 On the day of your cruise, there may be 2,000 to 5,000 people coming into port on your ship alone. Plus, there can be other additional cruise ships on any given day in Grand Turk. Now add in all the people on the island staying in hotels, condos and resorts, and you have quite a lot of competition for that particular day you want to Parasail. We are the ONLY parasailing boat available on Grand Turk and spots sellout fast!! So book now.